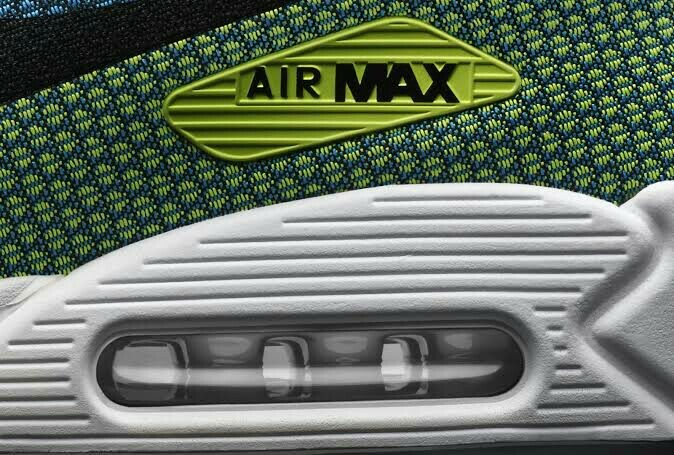 You know how some sneakers have those transparent little air pockets in the heel? I'd like to achieve that sort of 3D, smooth, glossy, rounded, translucent, light reflecting, window/bubble-like effect. Kind of like a glass pipe or, amplifier valve, or a test tube. So far, going with the sneaker bubble idea, I sketched this by tracing basic shapes, and then using a clipping mask to cut out the transparent parts. It's merely a gradient using transparency on the color stops. Set all the color stops to the same color (white in this case) and then adjust their transparency. 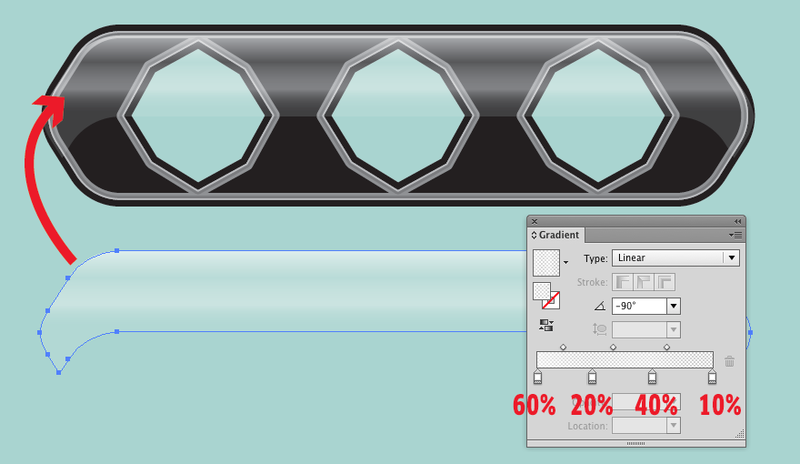 Sidebar: While possibly not imperative, a clipping mask for that shape may be overkill. All one needs is a standard compound shape. One can draw the reflections and make them transparent. There's already another answer which uses white gradients where the transparency varies, so here's something else. The reflections can also be generated with 3D effect. 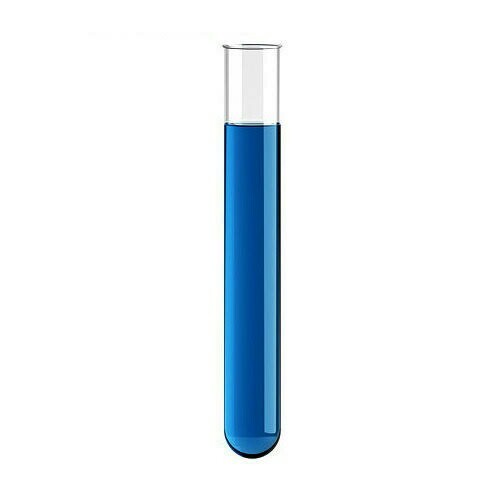 You need a glass tube - use Effects > 3D > Revolve to make it. Draw a grey rectangle, no stroke, make two its corners round. The grey shape is that in my image. You need also it's profile after revolving, so make an union of two pieces, another flipped. It's the leftmost piece in my image. As well you can split the wanted bubble profile and take a half to the revolution. The revolved result is in the right. Play with lights and the original grey color to get the right result. It must have full white highlight and deep black shadow. The shadow will be used to create transparency. In the next image the result of the effect is fixed by applying Object > Expand appearance. Before expanding you cannot rotate it. The prepared profile is used for a test panel and a white copy which will be the final gloss. The expanded revolution result is in the left bottom. In the middle the white shape and the expanded bubble are aligned, the expanded one is on the top, both are selected and the white shape has got an opacity mask. It's found in the panel menu of the transparency panel. In the right the transparent bubble is moved and aligned onto the test panel. 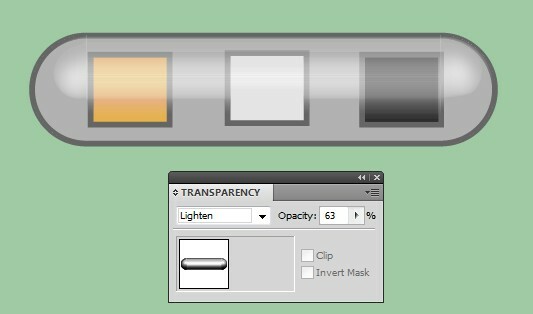 The opacity is reduced in the transparency panel to make the brightest white also a little transparent. The underlying white shape can be smaller than the panel. This is useful if one wants to limit the area of the reflection. This adds plausibility because in reality the reflection often comes from a window and there's shaded areas. Expanded 3D effect is a complex shape which can have hundreds of smaller shapes. It can make your Illustrator slow. Using gradients or a gradient mesh will eat much less computing resources. You can well use the 3D effect only as a model what to draw. You can also rasterize the 3D effected shape in a high resolution to save resources. In this case save the original somewhere. Not the answer you're looking for? Browse other questions tagged adobe-illustrator vector illustration illustrator-effects lighting-effects or ask your own question. How to create a “glossy text” effect in Illustrator? How to make glossy effect on stroke? How can i create following lighting effect in Adobe Illustrator?